Motorola worked in tandem with VivaLnk to create a temporary smartphone tattoo that unlocks the Moto X. The temporary tattoo would eliminate the need of one of the many security features available to unlock your device. Of course, it could also add to amount of measures used. According to the Vivalink site, the Digital Tattoos work by applying it to your wrist, unlock the Moto X manually, and then tap the back phone to the tattoo for it to sync. The tattoo works as a kind of barcode that the Motorola X can read. The temporary tattoo will unlock the phone after waking up the back of the phone it. In the FAQ, Vivalnk mentioned that the Digital Tattoo can work by proximity, but tapping it works better. Since the PIN is stored to the phone itself, there’s no threat of the phone being compromised from the tattoo. 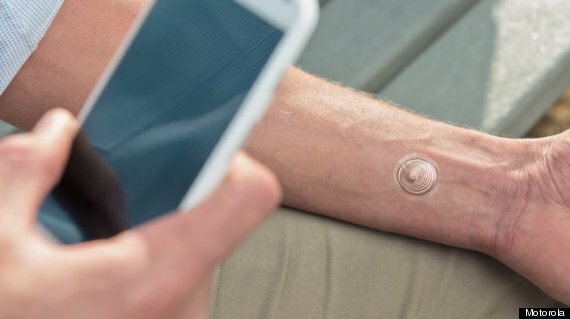 The Digital Tattoo is offered in a $10 ten pack, each one lasts for around five days and are durable enough to handle daily activity. As mentioned earlier, it’s only available for use with the Motorola X.